The start of the school holidays...and it's raining! We are creatures of habit in this house and even though I wouldn't stop the world to keep to a routine﻿, I do try my best to keep some things going. One of our 'traditions' is to stay at home for the first morning of the school holidays and make something nice for morning tea . This morning was no exception with the only difference that we had a few more kids in the house. On the menu this morning was pancakes. 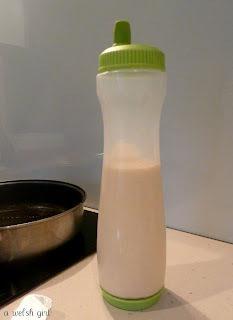 They are so easy to make and these little ones are particularly popular. You just add a bit more flour than usual so that the batter is slightly thicker and holds its shape. make a well and add the beaten egg, milk and melted butter. I then use a blending stick and whizz it around until the batter is smooth. Add a small amount of butter to a flat bottom frying pan or griddle and either spoon the batter into the pan or use one of these nifty pancake pens to make the job really easy. 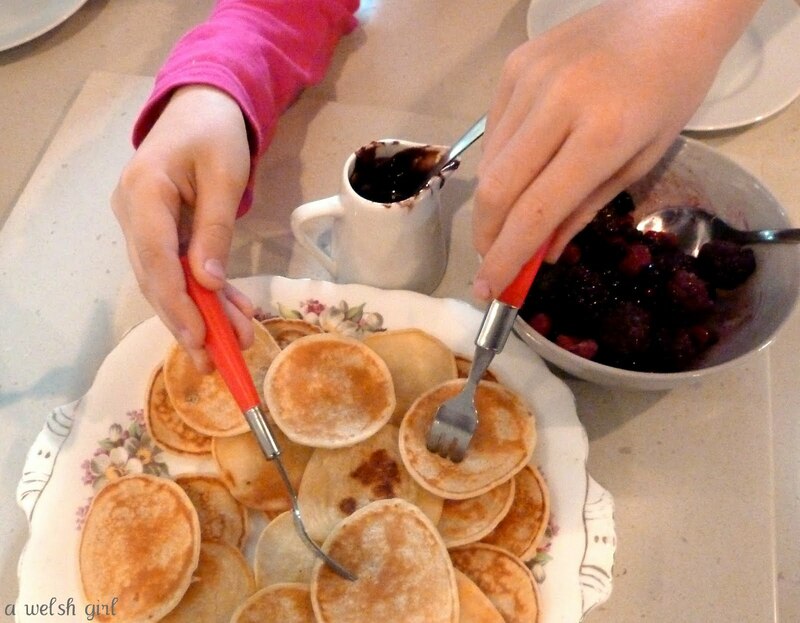 I love this pancake pen (Wheel and Barrow $20). If you're adventurous you can make all sorts of shapes of pancakes with it. We once tried an "S" - it looked good in the pan, but it was a little tricky to flip! The ingredients above would make approximately 40 small pancakes, give or take a few. The three kiddies that were here this morning devoured about a dozen each in a wink! I had some frozen berries in the freezer so we added some of those. In true Nigella style there was also some chocolate sauce left over from a dinner party that we had last night so I let them finish that off too....they were pretty happy chocolate faced kiddies after that! I had to quickly get these few on my plate before the whole lot went. so this morning Sibs and her little mates ran round playing all sorts of make believe games and left me to my own devices. This afternoon we all headed to the movies to watch "HOP". It's a fun Easter movie with a few laughs. There's nothing too scary, nothing too sad and the bunny is kind of cute. I quite enjoyed it myself. We have a day of no plans tomorrow...sounds good to me. What a great day for you and your kiddos. 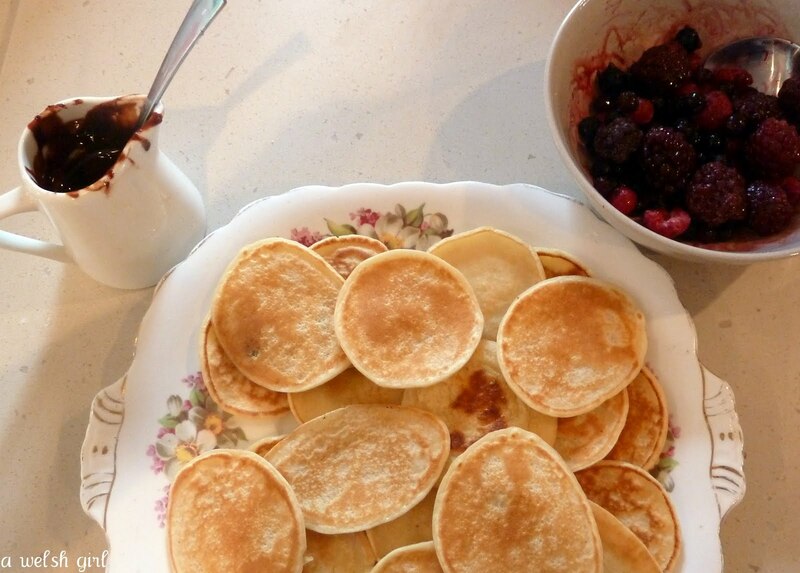 I love your tradition and your pancakes look delicious. I think I'm going to get one of those "pancake shapers"! I love your photos in this post. So recipe-book like. Anything Nigella-like is good in my book!! we also have a pancake tradition, but it's usually on a Sunday morning (not every Sunday - just when mummy feels like making them) and the kids like to eat pancakes and lemon curd! 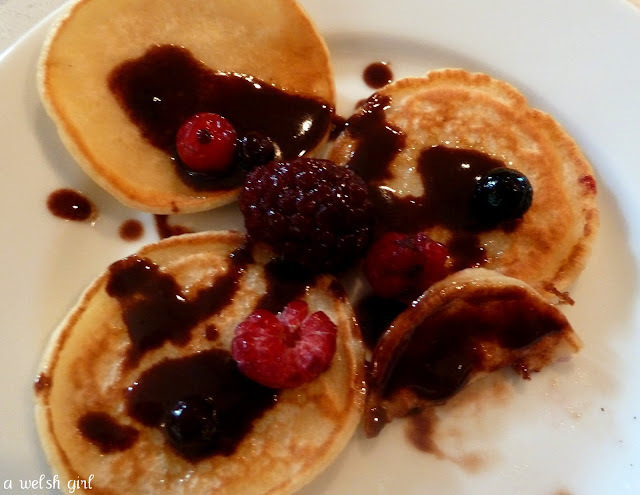 We only rarely ever have pancakes apart from on Shrove Tuesday before Lent starts, but your family tradition sounds and looks good! Yum, what a lovely tradition. I agree about the tribe of kids. Sometimes that is much easier. Keeps everyone busy.